I love stories about underground revolutionary forces. The mix of ideologies squaring off against one another, as well as the intrigue as the revolutionary group attempts to get by and achieve their goals from the shadows, offers a timeless kind of narrative drama and deep suspense. It’s an old narrative hook, and even we just look at gaming alone I’ve been playing games with this kind of plot hook for decades now. But done well it never ceases to drag me along for the ride. 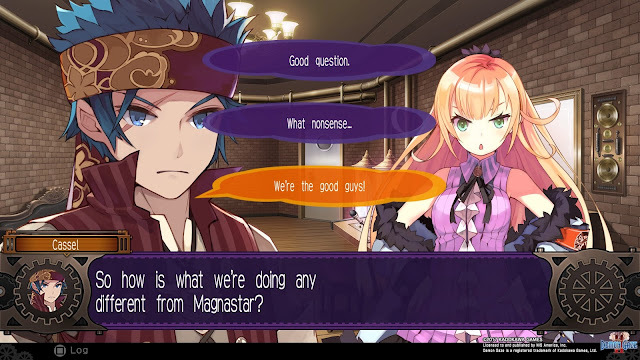 Related reading: Matt's review of the original Demon Gaze. This is the hook that Demon Gaze II uses to get draw players in, and it was indeed effective. I loved the first Demon Gaze on the PlayStation Vita - as did most JRPG fans that played it, because it did some genuinely impressive things with a genre that many had dismisses as quite staid. But it didn't have a plot nearly as far reaching as its sequel, and on top of telling a more interesting story, this one is simply that much more refined on every level. Throw in how gorgeous it all looks in HD on PlayStation 4, and what we’ve got here is perhaps the best Japanese dungeon crawler that we’ve seen in many, many years. Demon Gaze II kicks things off by putting you in control of a person who wakes up in the middle of a dungeon, suffering from amnesia. It’s the first, but not only bog standard JRPG trope the game will throw your way over its runtime, but tight storytelling manages to do some interesting things with the characterisation anyway. Our forgetful hero soon finds himself drawn into a conflict between a Soviet-style dictator, who summons and uses demons to control the city, and the resistance, who use your hero as a frontline fighter, as he has the ability to dominate and then control the aforementioned demons. What I loved about the plot is the way it builds the story of the resistance movement. I spent a number of years studying Soviet political history, and the way that dissidents would attempt to influence the population subtly, through their own propaganda via very underground methods to counter the leadership’s own propaganda, preferably without being caught doing so. In Demon Gaze II, one of the story progression metrics is getting more listeners onto a revolutionary radio broadcast that your side manages. Radio, of course, having long been associated with underground movements due to the difficulty that secret services once had with tracking it. As you complete more dungeons and defeat more bosses, magical seals that block the broadcast of revolutionary radio show falter, and more and more listeners flood in. 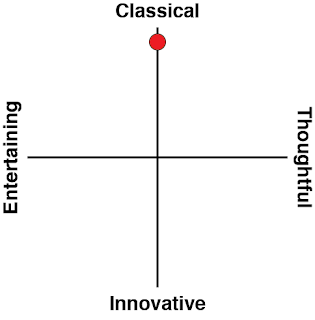 It's a rich theme, and while it's generally done well, it’s disappointing that there wasn’t more of a discussion around the ideologies, morals and ethics of it all. There are the hints of it at times - for example when one character questions whether the revolutionary forces are really any better than the dictator when they are using the same tactics. This is, of course, true of so many revolutionary movements throughout history; they start with noble intent, and the next thing you know you're Che Guevara putting Fidel Castro on the throne - and you can argue that they're still better than what they replaced, but the tactics and methods are highly questionable nonetheless. But in Demon Gaze II, the narrative asks questions and even attempts to come up with some answers, but over and over again the more meaningful stuff feels like it’s pushed to the background in favour of the standard anime game tropes. Likewise, on a more visceral level, there’s a real underdog against the odds story in there, but again, more could have been done to draw on that and create a sense of oppression, dystopia, and desperation. Right at the start I discovered a very socialist propaganda-style poster, and was expecting to be inundated with that kind of imagery, reflecting the oppressive nature of tyrannical rule when the leader aims to build a cult of personality around themselves. But that was left to largely peter out, particularly in the dungeons themselves, which, rather than genuinely reflect what we're told is going on in this oppressed and miserable city, what we see is, too often, standard Japanese dungeon crawling levels, which, while beautiful, left me with the impression that I was playing two different games at times. On the one hand I was following along with the political tensions in this world back at home camp, only to go off and explore standard forest, fire, and so on environments once it came time to do some crawling. Again and again Demon Gaze II pushes right up against telling a truly potent narrative, and reinforcing it with visual and gameplay themes, but so often it takes a step back from that to safety. 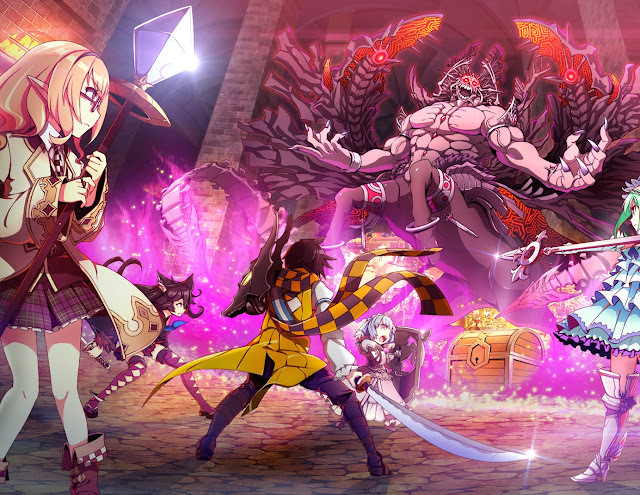 It's still very entertaining and very enjoyable, but games like Idea Factory's Mary Skelter, and Experience’s own Stranger of Sword City have shown that it’s entirely possible to have the dungeon crawler really press forward with adult themes, and tie the storytelling and gameplay together incredibly tightly, and I’d have much preferred that approach. That said, disjointed as it can be, Demon Gaze II was still engrossing, particularly considering the intriguing bits and pieces that you'll discover about your allies along the way that will make you think they’re not all that they seem either. Obviously I can’t give away spoilers, but for a genre that’s not generally not noted for its storytelling, Demon Gaze II does deserve credit for doing enough that I can spend half my review talking exclusively about the narrative. The characters themselves are a vibrant lot, even if the game takes a little too long in getting them established. None of the other humans accompany you on your dungeon questing - that’s for the demons that you'll capture along the way to do. Instead, they all hang around the home base of operations ands wait for you to drop in on them. The end effect is that “home base” has a more vibrant feel to it than most dungeon crawlers, which are generally a flat, static menu taking you to the shop, the inn, and so on. 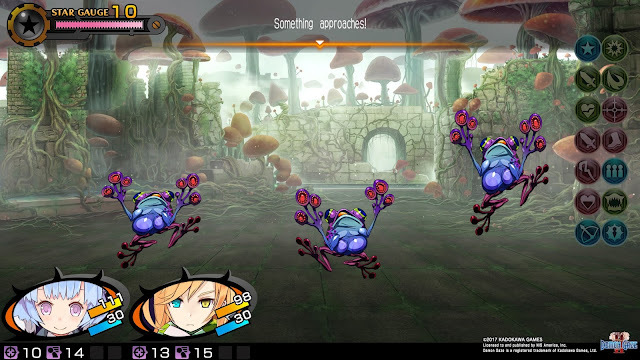 Once you’re in the dungeons themselves, Demon Gaze II distinguishes itself two of the same reasons that the original did; it has a neat mechanic where your party grows as you defeat bosses, and it is a game that is almost too beautiful. Most dungeon crawlers invite you to create your party of heroes from the outset; you’ll start out the game rolling up four or five, or however many characters, and then you’ll be dropped into the first level of the dungeon. In this one, you’ll start out with just the two characters - the protagonist and his first demon. Each dungeon level has a boss demon to fight, who will then join you once defeated. Each boss demon has a combat role to play, and then an exploration role. For example, that first demon that joins you has the ability to detect secret doors. Without her you’ll be fumbling around trying to make progress, given that many of these secret doors hide away areas that are critical to advance further. On that basis you might feel like you're obligated to keep this particular demon in your party, but that actually goes likewise for every other character. They all feel indispensable. Thankfully it’s quite easy to change the party around (once you have more demons than you can take with you at once), so exploration isn’t too hampered by this mechanic. It’s just the developer’s way of making sure you use all the characters available to you by constantly changing up the party's construction. 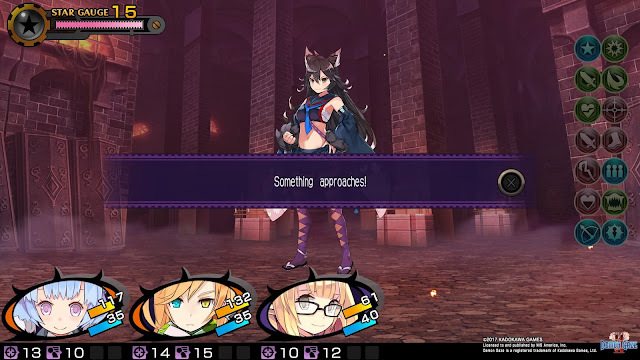 Exploration and combat in Demon Gaze II follow very close to the long-established dungeon crawler formula; as I explain in my video above, you need to “capture” a number of different points of power (big gems), and once you’ve done so, the boss monster shows up for a fight. 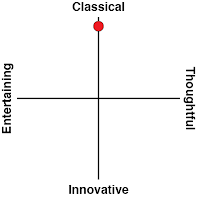 It's a really elegant gameplay loop, becomes comfortably familiar quickly, and plays very 'clean'. There was never a point with Demon Gaze that I felt overwhelmed or challenged in simply understanding what it was that I needed to do, and that's a sign of good design indeed. Compared with many other modern dungeon crawlers, your ability to customise characters and classes is fairly limited, though there are still plenty of equipment systems to play around with and the like so that min-max players won’t feel too hard done by by this game. Min-max players are going to feel like they don’t need to worry so much about crafting the perfect team, because for the most part Demon Gaze is also far less difficult than most dungeon crawlers. This was a deliberate attempt by the developers to make sure people finished the main plot, but it’s rare for this particular sub-genre to go easy on players, so it was a little disorientating at first to go into the first couple of boss battles with some apprehension only to discover that they wasn’t exactly punishing. Once I adjusted to the new expectations that the main game wouldn't be brutally difficult, I found myself really enjoying my time with exploration. As someone who's usually fairly timid in dungeon crawlers to make sure I don't delve too deep and get my party killed, I was more confident in exploring further and for longer in this game, and that meant that progress felt more fluid. There’s plenty of optional stuff to do which really ratchets up the difficulty, but that’s the kind of stuff I never really bother with as I like my games to have narrative context, but I'm told that it's as hard as the harder dungeons in the original Demon Gaze get. That should be enough to cater to all tastes. Additionally, a benefit from the easier difficulty and more relaxed pace to the game means you can appreciate the art that much more, and Demon Gaze II is a genuinely beautiful game. Enemies are simple 2D sprites, but they appear so large and so detailed on the television screen, and are animated so beautifully, that it’s hard to think of modern sprite art that is done better than these. This is doubly true of those boss monsters; they might not be the most difficult enemies in JRPG history, but they at least look imposing. Compared with the sprite work, the environments are a little less interesting; they’re blocky 3D spaces to navigate around, and as I already mentioned, they’re not really related enough to the narrative structure to really connect with me. The dripping atmosphere of Mary Skelter’s dungeons, or the beautiful serenity of Etrian Odyssey’s environments are far better examples of dungeon crawler worlds done well, because in those cases the environments directly related to the narrative structure and themes of the game. Dungeons are well designed from a level design perspective, however. 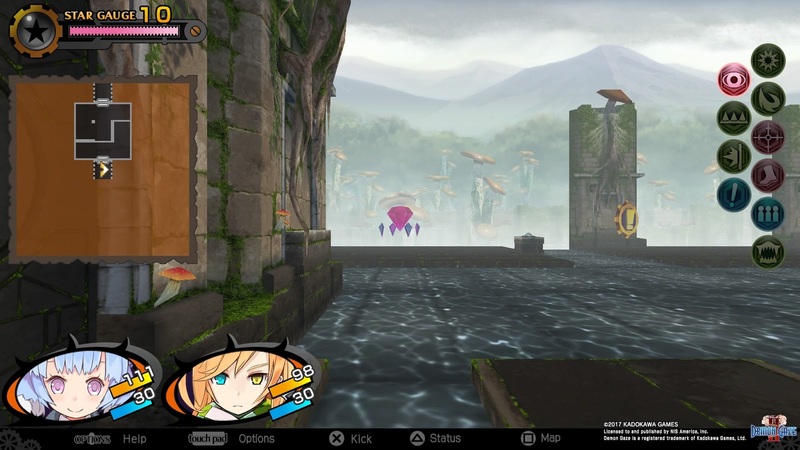 Too often dungeon crawlers artificially inflate difficulty by throwing devastating traps in that the player has no way of spotting, much less avoiding. Demon Gaze’s traps are more clear in where they are and what they do, and even if you accidentally trigger one, they’re more an irritation than a direct cause of a game over screen. While overall I'm ambivalent about my dungeon crawlers being easy per se (I must admit I like the grind that hard ones, like old school Wizardry, mandate), I do prefer them to be designed well enough that I feel like I have control over the exploration and what happens to my party, and I'm not going to run into deadly traps I had no information beforehand to know to avoid. 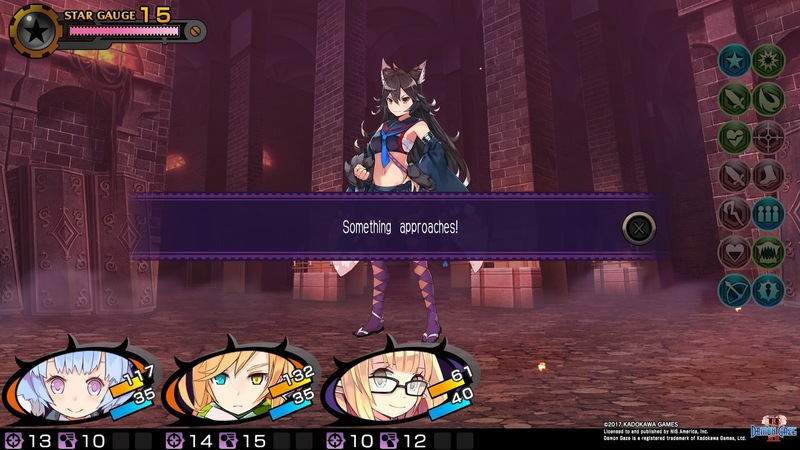 Further, much of Demon Gaze II’s puzzles rely on making sure you have the right demons in the party for their non-combat abilities, and they’re presented logically enough that players will need to think without getting too frustrated. I like that. Related reading: An in-depth interview with the developers of the game from Tokyo Game Show. Demon Gaze II is only one or two tiny steps away from breaking away from its genre trappings to be a game that is so good that people who don’t usually like the dungeon crawlers should give it a play. The developer has done a great job in making the game more accessible (while still leaving plenty of ultra-difficult stuff there for the really committed), and the art direction for the characters and monsters is so vivid and vibrant that you can’t help but admire them. There’s even an intriguing plot in there, but the slight difficulty that the developer has with pushing through and doing something really meaningful with it, and then linking the plot to the exploration of the world itself means that Demon Gaze II remains, principally, a genre piece that will only really appeal to existing fans of dungeon crawlers. Luckily for me dungeon crawlers are up there with my favourite of all.